Chez Carey! Thanksgiving contribution. Dumpling squash stuffed with veggies! I was in charge of bringing the vegetable to our Thanksgiving dinner this year and as luck would have it, Gabriel and I happened to stumble upon an amazing hydroponic farm a few days ago where we picked fresh produce to our hearts content. I was so inspired by all of the gorgeous vegetables there that I decided to combine a bunch of them into my contribution to our T-day feast. I started by halving and roasting sweet dumpling squash with a touch of olive oil, salt and pepper at 350 for about 35 minutes. I also sliced carrots, parsnips, beets, zucchini and summer squash and roasted them on a separate cookie sheet. Meanwhile, I sauteed the beet greens with some crimini mushrooms, garlic, red onions, olive oil, salt and pepper. 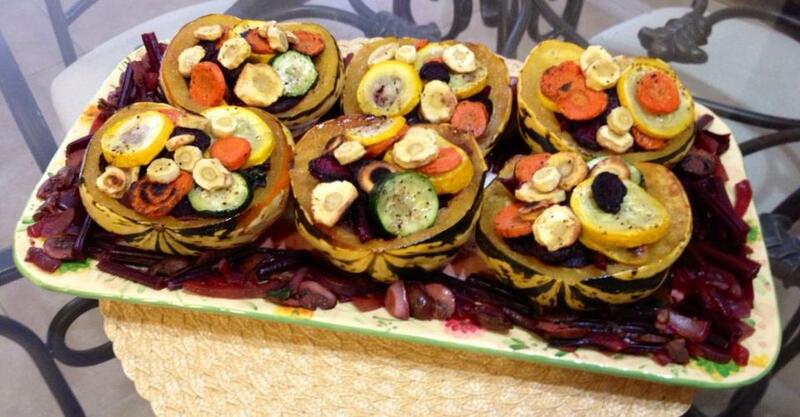 When everything was done cooking, I lined the squash halves with the colorful discs and filled the centers with the greens. I topped the greens with more roasted discs and placed them on a serving dish surrounded by the beet green stems and extra mushrooms. Beautiful AND delicious, if I do say so myself! I plan to finish them with a little fresh dill, cilantro and parsley just before serving them. Hope you and your loved ones all enjoy a happy holiday feast tonight!